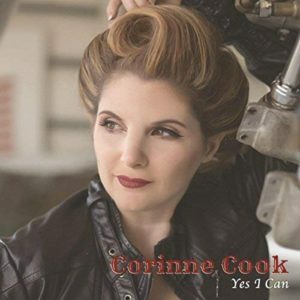 Yes I Can, the third studio album from Californian Corinne Cook, solidifies her position as one of the best song interpreters working in the independent modern country/pop scene today and establishes her as a promising songwriting talent as well. Cook’s willingness to continue growing as both a performer and artist sets her apart from countless peers and contemporaries who prefer perfecting a winning commercial formula durable enough to be revisited over the course of a long career. There’s tremendous intimacy personifying this eight song collection, despite whoever bears the individual songwriting credit, and this feeling testifies to the great pains Cook takes in matching up her talents with the right material. She’s taken equally great pains in surrounding herself with a first class cadre of talented musicians and stylists who help her bring these cuts to memorable life. The year may be more than half over, but Yes I Can definitely deserves consideration as one of the best indie releases in 2018. We get off to a smirking note with the album’s first two cuts “Last Thing to Go” and “One Box of Tissues”. It shows Cook has the ability to not take herself too seriously and wants to make her audience comfortable before launching into more serious material to come, but there’s plenty of spit and bite in these two songs without ever standing too far apart from the latter songs. We get our first dive into something much deeper with the title song and Cook’s testimony about the struggles of historical female figures before her in their effort to break down barriers she has never known shows her discernment as both a performer and a human being. This isn’t a political song; Cook doesn’t rage against injustice, but rather depicts with her dramatic vocal talents how she appreciates the changes her song’s subjects have affected on the world she knows. The chorus brings that all home for listeners without ever going overboard. “Trying Not to Die” represents the album’s first full throated trip into the ballad and she makes it soar thanks to the superb arrangement and canny instincts for where to place her voice within the song. “Mr. Mechanic” returns listeners to the playful demeanor we heard with the album’s opening songs sans any of the cattiness detectable in the phrasing and lyrics for those earlier songs. The tight, focused instrumental attack practically crackles with confidence and Cook clearly feeds off its energy. This will be a real winner live in concert. “Seven White Stars” and “Those Few Dreams” bring Yes I Can to its close with impressive empathetic and well written songs that, due to their military subject matter, Cook undoubtedly relates to quite profoundly. You hear it in every line. The fiddle accompaniment in the former tune is its crowning musical achievement while the concluding track toys with some light orchestration in a successful effort to invest the song with even more grandeur. This is a thoroughly satisfying release in every way and Cook’s best yet.